Clients are increasingly aware of the wide variety of toxins that may be in their bodies, including herbicides, pesticides, food additives, air pollution, and household chemicals. When ingested, these chemicals can remain in the body for years, altering our metabolism, causing enzyme dysfunction and nutritional deficiencies, creating hormonal imbalances and lowering our threshold of resistance to chronic disease. Today, studies show that most of us have between 400 and 800 chemical residues stored in the fat cells of our bodies. When our bodies exceed the limit that we can excrete, we begin to store these toxins. The Maximum Purification and Detox Treatment along with Steamy Wonder Portable Steam Sauna provide the ultimate detoxification. Regular Steamy Wonder Spa™ treatments can be offered as a standalone modality or combined with other healing therapies such as massage, to provide a practical and enjoyable way to help clients remove these toxins from their bodies. Benefits of detoxification include weight loss, pain relief, increased alertness and energy, lustrous skin and eyes and enhanced immunity. Heat experienced during a Steamy Wonder Spa™ treatment speeds up the chemical processes in the body, making it one of the most simple and comfortable ways to rid the body of accumulated toxins. As the pores open up and the million of sweat glands start to excrete, the body rids itself of metabolic and other waste products. Sweat contains almost the same elements of urine, as for this reason the skin is sometimes called the third kidney. Regular sweating can help detoxify your body as it rids itself of an accumulation of carcinogenic metals (lead, mercury, zinc, nickel and cadium) as well as alcohol, nicotine, sodium, sulferic acid and cholestrol. Sweating is such an effective de-toxifier that some physicians recommend home saunas to supplement kidney machines. Sweat also draws out lactic acid which causes stiff muscles and contributes to general fatigue. As you relax in the Steamy Wonder Spa™, your body is actually working hard to eliminate toxins and burn fat. Weight loss becomes possible because body fat becomes water soluble at 110 degrees and the body can sweat out fats, toxins, and heavy metals. During a heat treatment your heart works harder pumping blood at a greater rate to boost circulation, supplying the conditioning benefits of continuous exercise. Heart rate, cardiac output and metabolic rate increase. Because the metabolism rate increases during the Steamy Wonder™ treatment you are burning calories, not just water! "I have been using the Steamy Wonder Spa™ on my clients for cellulite reduction for over ten years. The steam therapy is an essential tool in increasing circulation in stagnant tissue and eliminating the toxins that are loosened manually. Essential oils, which boost circulation and decongestion, are used both for the massage and steamed over the client. We offer a series of treatments to help clients achieve maximum results." The skin is our body’s largest organ and is essential in eliminating impurities. As we sweat in the Steamy Wonder Spa™ the skin pores begin to open and built-up sebum and impurities move out. Dead skin cells are softened and exfoliated as new softer skin can emerge. Effective cellulite reduction can be achieved by increasing circulation, stimulating metabolism, detoxifying and eliminating excess fluids. The Steamy Wonder Spa™ used in conjunction with detoxifying mud and essential oils and/or manual manipulation of the tissues accelerate effective cellulite reduction. The skin is our body's largest organ and is essential in eliminating impurities. As we sweat in the Steamy Wonder Spa™, the skin pores begin to open and built-up sebum and impurities move out. Dead skin cells are softened and exfoliated as new softer skin can emerge. Acne: Perspiration emulsifies the fat of the sebaceous glands, clearing them of sebum and bacteria which is excellent for acne. Anti-Aging: Exfoliation treatments with the Steamy Wonder™ open the pores, allowing the superficial and deep layers of the skin to be receptive to the nutrients in natural skin care products. The deep penetration of vitamins, minerals and moisturizers help restore and maintain skin elasticity and tone. The steam creates a seal on the skin's surface, enclosing the nutrients within the layers of the skin where they may be absorbed and processed. Dry Skin and Wrinkles: Increased blood supply rushes fluids to skin's surface enhancing the development of collagen and filling in the spaces around cells, plumping up wrinkles. Stimulating the skin on a regular basis helps combat the collagen breakdown that generally results in aging and sagging skin. The resulting effect is deeply moisturized, hydrant skin. The most immediate benefit of a Steamy Wonder Spa™ Portable Sauna treatment is relaxation. In just a few minutes the gentle warmth of the Steamy Wonder Spa™ softens hard knots of stress by loosening up all the muscles and allows the clients to deeply relax in the privacy and silence of the Steamy Wonder Spa™. With the addition of our custom, dried herbal blends placed directly into the steam generator your client will experience deeper benefits of relaxation and rejuvenation. An artificial fever induced by Steamy Wonder Spa™ treatments can also help with mood elevation. A study conducted by H.I. Robins at the University of Wisconsin found that "mood states of cancer patients following whole-body hyperthermia show a significant improvement in depression. This was attributed to the increased B-endorphins, the same endorphins released with exercise. Steam therapy has been used for hundreds of years by many cultures in the treatment of arthritis, rheumatism, joint stiffness, muscular pain and spasms. Pain is found to be alleviated in just one session and the benefit can last for several days after the treatment. Regular steam treatments 2 to 3 times per week have shown to have profound relief for those having muscle pain due to injury, menstruation pain, headaches, fibromyalgia and low back pain. The deep heat of the Steamy Wonder Spa™™ helps to relieve pain by causing the blood vessels to dilate. This causes increased blood circulation and allows more oxygen to get to soft tissue injuries and sore muscles. This helps to reduce pain and speeds up the healing process. Increased blood circulation carries metabolic waste products and delivers oxygen rich blood to oxygen-depleted muscles so they recover faster. Muscles relax most readily when tissues are warm. Sauna bathing has been used as a thermal therapy to treat pain and other symptoms of rheumatic disease. In studies based on interviews of over 200 patients, 40% to 70% of participants reported that sauna bathing alleviated pain and improved joint mobility. "I found it be a very powerful healing tool. One client's neck and shoulders were so tight and sore that it was like touching a board when I started working on him. He had been to a chiropractor and they had given up on him-they couldn't get his muscles to relax. After 20 minutes in the Steamy Wonder Spa™, he walked out smiling and said his neck and back felt a lot better. He came back a week later and he still felt good and wanted another session to ensure that he wouldn't tighten up again." "My client was in a severe auto accident. The client suffered severe nerve damage, headaches and rotary cuff damage that left her with limited use of her left arm, as well as continual pain. The only relief she experiences is with my treatment of steam, massage and aromatherapy three times per week. She leaves my office glowing—almost euphoric—with no discomfort. I know that the steam has played a major role." "We treat many people with fibromyalgia. With the steam treatment after a massage, clients recover instantly. No soreness after the massage. The treatments are absolutely phenomenal. We are seeing great results." Steam inhalation is an effective treatment in respiratory conditions and is highly recommended for treatment of sinusitis, bronchitis, allergies and asthma. "One man could hardly breathe. He did a 15 minute Steamy Wonder Spa™ treatment. The next day, he said 'I can breathe, I´m not sick, it's wonderful!' 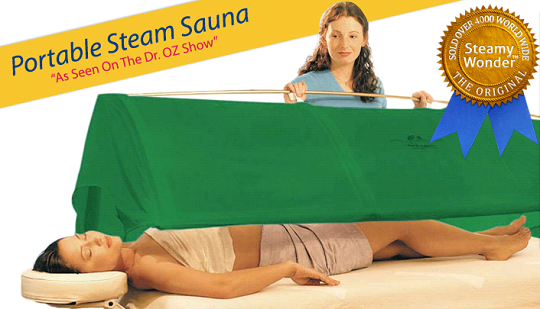 "
Steam therapy assists in alleviating inflammation and edema. The increased peripheral circulation provides the transport needed to help eliminate the edema which helps to end inflammation, decrease pain and help speed the healing process. Heating of one area of the body produces reflex modulated vasodilation in distant-body areas even in the absence of a change in core body temperatures. If, for example, you heat a forearm, then both lower extremities dilate or if the front of the trunk is heated then the hands dilate. Heating of muscles produces an increased blood flow similar to that seen during exercise. Temperature elevation produces an increase in blood flow and dilation directly in capillaries, arterioles and veins thus widening the blood vessels. The new Sore Joint & Muscle Pain Relief Treatment is the best way to enhance the benefits of the Steamy Wonder Portable Steam Sauna for all kinds of chronic pain. Traditionally, the benefits of steaming include increased energy, decreased incidence of infections, and fewer colds and flu's. Many regular steam or sauna bathers have experienced that a good long sweat bath at the early onset of a cold or flu can help ward off the disease before it manifests as actual symptoms. The heat from a Steamy Wonder Spa™ treatment raises your core body temperature, inducing an artificial fever. During a fever, the production of white blood cells is increased, as is the rate of their release into the blood stream. White blood cells are the primary agents of the immune system. As the generation of antibodies speeds up, so does the production of interferon, an anti-viral protein. In this manner, your body's immune system is strengthened as it works to combat the fever. "We just bless you guys every time we use the Steamy Wonder Spa™ and so do our clients. It has increased our business so much. Doctors are sending their patients here instead of prescribing antibiotics. One doctor sent his wife and child, both of whom had mononeucleosis. Within 24 hours of one Steamy Wonder Spa™ treatment, their white count went from 19 to 10." At the same time, sweating helps eliminate toxins and waste products from the body and overall health and resistance to diseases is increased. After detoxification, your immune system has less "housecleaning" to do and can focus on protecting your body from more serious health threats. produced by sweating, overall health and resistance to diseases is increased. Do not receive steam therapy if you pregnant. Due to the increase in cardiovascular activity brought on by heat, steam therapy is not recommended for those who have high blood pressure, heart disease, or other cardiovascular problems. Do not receive steam therapy if you are extremely frail, sick or elderly. Do not receive steam therapy if you under influence of non-prescription substances. If you have a doubt about your health, we suggest that you obtain your doctor’s permission to receive stem treatments.